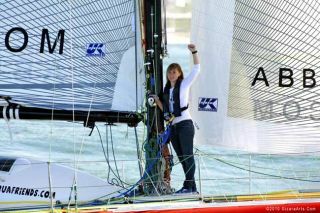 Abby Sunderland waves from her vessel, Wild Eyes, as she attempted to be the youngest person to sail the world solo, a record previously held by her older brother. Lostand alone in the middle of the Indian Ocean during a furious storm,things werelooking bleak for 16-year-old Abby Sunderland. Sunderlandwas on a mission to be the youngest person to sail the world solo andnonstop,a record previously held by her older brother Zac. But her 40-foot(12-meter)-longvessel, Wild Eyes, was damaged in the storm, leaving her stranded inthe middleof the IndianOcean. Sunderland activated her emergency signaling devicesand NASA's Searchand Rescue Satellite-Aided Tracking (SARSAT) system pinpointed herexactlocation in less than an hour during the aggressivestorm. She was rescued two days later. Nearlysix months after the swift rescue, Sunderland got to thank the peoplewhodeveloped the technology used to save her life. Sunderlandvisited NASA's Goddard Space Flight Center in Greenbelt, Md., to meetSearchand Rescue Manager Dave Affens and the team of engineers behind SARSAT,whichhas saved more than 205 lives in the United States this year alone. "WithoutNASA technology, she may have lost her life," Affens said. Sunderland'sjourney from Marina del Rey, Calif., to her dismasting 2,000 miles(3,218kilometers) from the nearest land, included safetymeasures and devices thatultimately saved her. Wild Eyes was equipped with a safety beacon and ahandhelddevice ? about the size of a BlackBerry ? that emitted an emergencydistresssignal picked up by a SARSAT satellite orbiting 22,500 miles (36,210kilometers)up in space. "Wedeveloped the concept of detecting distress signals by the satellite,relayingit to the ground stations where the locations were calculated," Affenssaid. "We then launched the distress-detection device on a NOAA (NationalOceanic and Atmospheric Administration) weather satellite,tested theconcept, and approved the system for operational use." Thedistress device operates for a minimum of 48 hours after the useractivates theemergency signal. These extra hours are vital given that most rescueteamscannot reach the individual until after a storm subsides, which can bemorethan a day or two. In Sunderland's case, the boat sent to rescue herarrivedtwo days after she had activated her device. Sunderland'ssignal reached an Indian satellite (INSAT) and two NOAA weathersatellites thatwere launched by NASA and used NASA technology. Sunderlandwas amazed by the quick rescue response. "Itwas a real surprise when the airbus flew over me. I wasn't expectingit, I wasexpecting it to be weeks," Sunderland said. "When you set off yourbeacon, you know someone is going to hear you, but I wasn't sure if Iwas goingto be helped. But I don't think it could have been done any faster." Afterreceiving Sunderland's signal, the satellite then relayed the signal totheUnited States via the international satellite-aided search and rescuenetwork comprisedof 40 participating nations. BecauseSunderland used the device correctly and made a point to register thebeaconwith NOAA (adding personal and contact information), the U.S. CoastGuard'sPacific Area Command in Alameda, Calif., was able to contact herparents inless than 10 minutes. "Wecouldn't ask for a better scenario," said U.S. Coast Guard's AdolfoViezca. "When beacons aren't registered and I'm on the receiving end, I don'tknowwho you are, where you are and I end up with a quagmire." Sunderlandstill plans on sailing the world solo, carrying the beacon and relyingon NASAtechnology. "Overall,it's the best experience of my life," Sunderland said. Thisarticle was provided by OurAmazingPlanet,a sister site of SPACE.com.